When talking about 3D-capable mobile devices such as smartphones or tablets, and even if we include ultraportable laptops as well there are actually still not many products on the market. The problem is that people kind of expect to get glasses free 3D display on those devices and that is still a bit of a problem to achieve in both technological way if you want to provide a really good experience as well as to make them affordable, resulting in an end user price not much higher than what the same device with a 2D-capable display would cost. And while autostereoscopic 3D technology still has some way to go it is already starting to get quite good and affordable for smaller size displays such as the ones found on mobile devices, so this year we finally may see more products and increased interest in smartphones and tablets with not only 3D-capabilities, but also with glasses free displays. Meanwhile however the most popular way to get 3D support on your smartphone or a tablet is to get a piece of 3D film that will make your 2D display capable of showing 3D images without you having to wear any kind of 3D glasses. With mobile devices getting higher and higher resolution displays with more pixels per inch their screens it is not much of a problem to have the resolution halved when displaying stereoscopic 3D images on them. There are already a lot of such products available on the market, most of which are targeted for iPhone and iPad users, but some also cover other mobile devices as well. There however are some drawbacks with most of these 3D film solutions, relying on either parallax barrier or lenticular principle of work. Things like reducing the brightness, being hard to apply, bringing uncomfortable feeling when used or too thick to properly relay touch controls, problems with useability in 2D mode, working in only one orientations and others are some of the factors that are contributing to the not so fast adoptions even though the potential market is really huge. There is a new company on the horizon called Nanoveu that promises to soon deliver a product based on nano technology that is supposed to change the generally not so good impression about 3D film-based products intended to make your mobile device with 2D display into a 3D-capable one. What Nanoveu promises is a solution that addresses all of the issues that most other similar products currently have and thus providing a really enjoyable experience when viewing 3D content such as photos, movies or even games. Nanoveu’s 3D film is supposed to be very thin (0.1mm) and flexible and be able to also act as a screen protector for the device it is applied on, be very lightweight and low cost to make and with a more affordable end-user price, easy to be applied and to be removed, and not needing power source to function. Furthermore you apply the Nanoveu 3D film you should be able to use your device for viewing 3D content in both Portrait and Landscape orientation, and you should be able to use your device in 2D mode without having to remove the 3D filter. These two things are among the most annoying limitations that pretty much all other solutions on the market have and normally users don’t like to have a lot of limitations, they just want to be able to use their mobile device in 3D mode as easy as it works in 2D mode. Furthermore we get a promise for no visual brightness loss with the filter applied, smoother feeling and no problems whatsoever when using the touch functionality of the display. So far it all sounds really promising and Nanoveu expects to be able to start shipping their NanoFlez 3D film on 2nd of April with pre-orders for it currently going on the company’s website. One more important thing regarding the NanoFlez 3D film from Nanoveu that you should be well aware of, the autostereoscopic 3D functionality that the product will be introducing would also require a special software that will have the image displayed in as special format that the 3D film will be able to show in 3D. This means that in order to see a 3D photo or watch a 3D movie you’d need to download this software and play the 3D content over it, currently there is not much information about the software available and I could not find anything published on the AppStore, though there is time and it will probably be released closer to the time when the products start shipping. Nanoveu also mentions the ability to play games in stereo 3D using their 3D film, this would either mean a software able to convert normal games into stereo 3D ones (not likely) or the more likely solution would be to have the game developers start to add stereo 3D output support for the NanoFlez 3D film. Either way you should think about 3D photo and 3D movies for now with stereoscopic 3D gaming as something that you might get at some point as well. The fact that the 3D film is going to be made available not only for iOS devices, but also for Android based ones as well as Max OSX would mean that there should be versions of the supporting software made available for the various platforms as well and in reality this can slow down the release of the Android and OSX products more than the time that is needed for the development and production of the actual products. In the end it is also very important what the end-users will think about the product and if they will like it or not, Nanoveu has already generated a lot of interest before delivering the actual product, so let us see what will happen when it starts shipping. The company has been demonstrating their product on this year’s CES and Neil Schneider from MTBS has managed to get a short interview with the company’s Founder and CEO Alfred Chong there, you can watch the video interview embedded above. 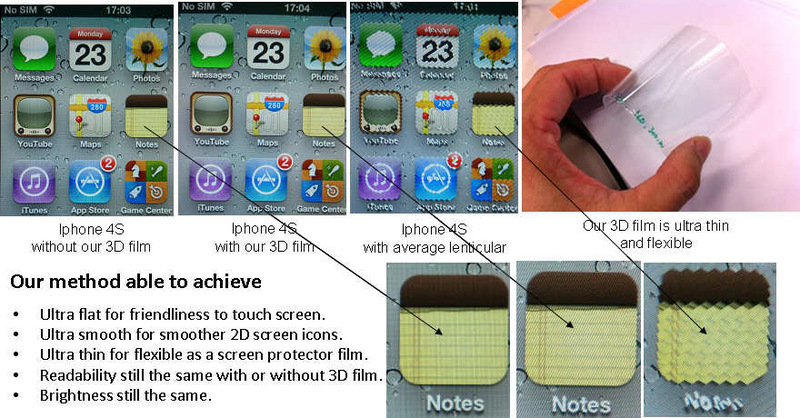 Initially Nanoveu is going to be offering the NanoFlez 3D film for iPhone 5 and iPod Touch 5 owners only, and if you pre-order it before March 15th you can get free shipping. The price of the NanoFlez 3D film for iPhone 5 or iPod Touch 5 is $29.95 USD and is sounds very reasonable if the product is able to really deliver what the company promises. Nanoveu also has plans for offering their 3D film for other devices such as the iPad 3/iPad 4, Samsung Galaxy S3, Samsung Galaxy Note 2, HTC DNA/Butterfly as well as even for the Macbook Pro with Retina Display systems as well as others. As I’m still a user of an iPhone 4S I’m currently more interested in the upcoming iPad version of the product, but if Nanoveu’s 3D film really delivers what they are promising I could as well finally find a reason to upgrade to an iPhone 5. Nevertheless I’ll keep an eye on how things are progressing with Nanoveu as they have developed a very promising technology with a lot of potential that can really drive the adoption of 3D solutions among mobile device users.